I tried hard to find some appable ideas about making foam. But they simply don't exist. We have some sage words, below, but that's all there is! It is trivially easy to make a foam - just mix air and liquid with some energy and bubbles will form. If these bubbles reach the surface with a liquid fraction ε in the 0.1-0.2 range then they are a kugelschaum ("kugel" means "sphere" and "schaum" means foam). These foams are not really considered in these apps. When ε <0.1 then we have a polyederschaum (polyhedral), the classic foam that is the central concern of Practical Foams. Although it is easy to create a foam, in most cases it is totally unstable. So the question of making foam is not so much about how to make them (which is trivial) but how to make them stable (which is not). 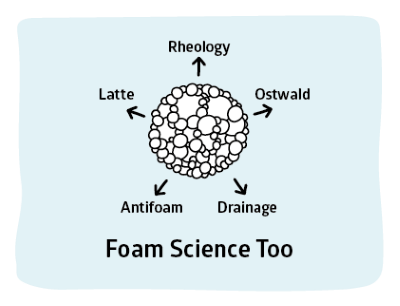 In the AntiFoam section we will discuss the even more difficult question of how to make a stable foam unstable. As noted in Basics, the energy required to create a foam is inversely proportional to the surface tension, γ. The low surface tension certainly helps, but if γ changes from 40 (a "bad" surfactant) to 20mN/m (a "very good" surfactant) it's only halved the energy needed, which isn't all that significant. Consider low γ as necessary (after all, pure water can't form a foam) but not sufficient. So what things are required? Disjoining pressure. The second reason that surfactants help create foam is that the liquid in the foam walls is naturally sucked out of the walls into the edges. This is nothing to do with drainage (as explained in Drainage, the walls contain an irrelevant fraction of the liquid), it is just simple capillarity. The capillary pressure will keep pulling liquid out unless a counter pressure ("disjoing pressure") acts against it. This can be produced by charges on the surfactant either side of the wall and/or by steric interactions between surfactant chains. These effects are discussed in DLVO, but because the charge effect operates over large distances (50nm) compared to the small distances (5nm) of steric effects, in general ionic surfactants are much better at creating stable foams. Resistance to ripening. The Ostwald ripening effect means that small bubbles shrink and large ones grow. As the Ostwald section shows, this is partly controlled by the gas (CO2 falls apart quickly, air/N2 is slower and C2F6 much slower) but also by how good a barrier to gas diffusion the "wall" of surfactant at the surface provides. Resistance to drainage. The more water around the foam the less risk (in general) of it becoming damaged. So a foam that drains quickly is more likely to become damaged. As we will see, to resist drainage you need high viscosity and small bubbles, though the surfactant wall has some effect on the drainage process with stiffer walls giving (usually) slower drainage. Resistance to defects. If oil or a hydrophobic particle can penetrate the foam wall it can cause the wall (and therefore the foam) to break. Although there are plausible and simple theories (discussed in AntiFoams) of Entry, Bridging and Spreading coefficients they turn out to be of limited predictive value. Once again they are necessary but not sufficient. The key issue is the Entry Barrier. When this is high the foam is resistant to defects. These principles are so easy, yet creating foams efficiently is surprisingly hard. Why? The key issue is timescales. If a surfactant is marvellously elastic and has a strong disjoing pressure and is a good gas barrier and has a high entry barrier it might (and usually does) fail to form a foam because it takes too long to reach the liquid/air interface and form its strong resistant domain so the foam has already collapsed. On the other hand, a surfactant that quickly reaches the surface to create an adequate elasticity and disjoing pressure will produce large volumes of foam - though the foam will collapse quickly, especially in the presence of oily impurities such as grease being washed from one's hands. This leads us to the issue of Dynamic Surface Tensions. It would be wonderful to provide an app that fully described the complexities of DST and which therefore allowed you to produce a mixture with very rapid decrease of ST to give the fastest possible foaming behaviour. But my reading of the literature is that it is quicker to measure the DST behaviour using (most usually) a Maximum Bubble Pressure device (which creates bubbles over different timescales and therefore gives the surface tension at each of those timescales) than it is to attempt to describe the behaviour via theories. In particular, there are great debates about whether DST is limited by diffusion, by barrier entry and/or via the need to come out of a micelle before entering the interface. My reading of the excellent review by Eastoe1 is that simple diffusion dominates and that the existence of micelles largely makes no difference because the timescale for a surfactant molecule to partition from the micelle is very fast even though the timescale for micelle formation/collapse is very slow. Of course one can find real cases of entry barriers and real cases of micelle-limited diffusion. But it is even more complicated. An extensive analysis from U. Sofia shows that there are 4 possible outcomes in systems containing micelles, two of which are indistinguishable (to the casual observer) from simple diffusion kinetics and two of which might be confused with barrier kinetics. Finally, distinguishing entry-barrier and micellar effects from the effects of small amounts of impurities in the surfactants is surprisingly difficult and for the practical formulator using commercial, unpurified surfactants there is little hope of understanding the subtleties of DST curves. The take-home message is "Don't formulate foams without measuring DST, but don't spend too much time theorising about why you get great results for some specific surfactant combination." I don't like writing such advice as I usually find that good models are the best way to avoid lots of lab experiments. Maybe my reading of the literature is too pessimistic. If it is, please send me the literature that would allow me to create a helpful DST app. The harsh reality is that successful foaming agents tend to be mixtures, with all the complexities they induce. The ubiquitous SLES/CAPB (Sodium Laureth Sulfate/CocoAmidoPropyl Betaine) mixture happens to be made from two excellent fast foamers. The CAPB on its own produces a lot of stable foam, but is rather expensive. CAPB is especially good at creating a high entry barrier so is resistant to oils during the creation of foam. SLES on its own produces a lot of relatively unstable foam. A mix of the two provides a good balance of cost, foam and stability. However, adding a small % of lauric or myristic acid has a dramatic effect on foam stability. It increases elasticity but also slows down bubble growth (Ostwald ripening) dramatically, so the foam remains small. This has a big impact on the ability of water to drain from the foam - drainage speed goes as Diameter² - and the dryer the foam the more easy (other things being equal) it is to break it apart. The long-chain acids on their own are useless as foaming agents (and as sodium salts are of modest foaming ability as common soap, easily wrecked by hard water). The combination of SLES/CAPB/Long-chainAcid is a potent mix for creating a foam with small bubbles and a long life-time. Indeed, a simple way to transform a hand-soap to a shaving foam is to add a few % of the long-chain acid. But what about my surfactant system? The rules for creating a good, stable foam (or, indeed, the rules for making sure that such a foam is not created) are simple and clear. So why is it so hard to create new foam formulations? The answer is that if you have the right set-up to measure all the basics: CMC, Γm, disjoining pressure v film thickness, interfacial elasticity and entry barrier then it's rather straightforward to make the best out of any set of surfactants and foam boosters you happen to want to use. The measurements can largely be automated so lots of formulation mixes can be screened quickly. One problem, as mentioned above, is timescales. Most measurements are made after comparatively long times so it needs extra time-dependent experiments to see if the appropriate parts of a surfactant blend will get to the surface fast enough to create a foam which then becomes stabilised as the slower components arrive to form a tougher surfactant layer. The other problem is that small additions of co-surfactants, foam boosters etc. can make a large difference, so it is necessary to carry out measurements on large numbers of samples. A robotic lab set up to do lots of high-throughput screening can do a lot of the hard work, but most of use don't have access to such a lab. In the longer term, a theory that could predict the interfacial behaviour of mixtures of ingredients would make development of foam much more rational. But such a theory seems to be a long way off. It seems obvious that you can't make foams in oils. 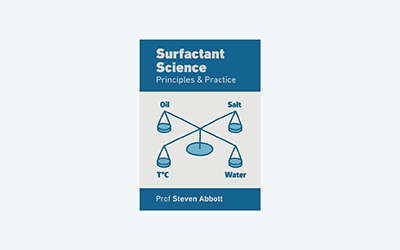 The surface tensions of oils are low and a surfactant can't make much difference and therefore the crucial elasticity stabilising effect cannot come into operation. This is generally true for simple hydrocarbon oils. To produce foams in these you need to use clever particulate tricks such as lyotropic phases of specific surfactants (such as mono-Myristylglycerate) or hydrophobised silicas (look up Binks in Google Scholar). But the real oil industry has massive problems with foams and the art/science of finding defoamers for each specific crude oil is a major challenge. Why do many crude oils foam? The clearest scientific description of this comes from work by Callaghan and colleagues at BP2. They carefully extracted all the acidic components from a wide range of oils (these typically represented only 0.02% by weight) and found that the oil showed (a) no elasticity and (b) no foaming. If they added the extracts back to the no-foam oil then both elasticity and foaming returned. The acids were rather simple long(ish)-chain alkanoic acids such as dodecanoic. Although this paper did not record the surface tensions of the crude, other papers show typical values in the low 30mN/m but which can be reduced to the mid 20's by additions of simple surfactants or defoamers. This is not a huge decrease and, therefore, the elasticity effects cannot be large. However, in crude oils the pressures can be very high so the bubbling can be very violent when the crude reaches atmospheric pressure, so it doesn't need a very strong surfactancy effect to cause massive foaming. Going back to the other type of foam stabilisation, crude oil is usually complicated by the presence of asphaltenes which can readily crystallise/cluster at the air/oil interface and provide foaming in that manner. And, as we will see, foam stability is greatly enhanced by high viscosity which many oils can readily supply. But nothing is simple: asphaltenes have been shown to be veryy modest surfactants that can produce foaming in toluene where they are (by definition) soluble. This is a huge subject. The only point raised here is that for oil/petrol fires the surfactant should not be good for emulsifying the oil with the water in the foam. Therefore the system needs a large "Spreading Coefficient" (see the Antifoam section) which in practice can only be achieved with fluorosurfactants. Such foams are astonishingly good at being jetted through huge flames to land nicely on the surface of the burning liquid (which, to the surprise of many, is "only" at its boiling point - not some super-high temperature) and put out the fire. For really robust foams adding a protein surfactant is a good idea - usually as part of a fast/slow mix of a normal fast surfactant to get the foam going and the slow protein which reaches the interface after a time and renders the whole thing remarkably solid. Alternatively some high MWt polymers can perform this function to create an AR-AFFF Alcohol Resistant-Aqueous Film Forming Foam which means one that works not only on non-polar fires but also on polar fires for which a conventional foam might be too compatible with the liquid.